Last year, we salty citizens were introduced to MALL, a beautiful, brilliant (and totally enlightening) sensory experience. This year, thanks to the brilliant minds at V. Project and 7D8, we can all start gearing up for MALL2, which aims to let attendees explore "experiences around emerging concepts in product, fashion, graphic and retail design". Sounds like complicated stuff, but really it's just a super center of the arts, bustling with savvy people, swell design, and (literally) sensational experiences. V. Project's Gary Vlasic sums it up astutely: "In this age-of-internet, when traditional retail spaces are becoming more and more obsolete, MALL is intrigued by what is being gained and what is lost in this new paradigm of commerce." And our horizons are expanding in anticipation. MALL2 is, essentially, "a gathering space for exploring design and to display products, fashion concepts, graphic arts, and food as a design medium". This gathering of goods is groundbreaking, to be sure, and as lovers of the curated and fans of the fine-tuned, we COLLECTIVELY shed a proud tear. The event, running from August 14th - September 12th, features a few art-infused events you ought not to miss. Exhibits, installations, lectures, and workshops are peppered throughout (featuring design talents and studios from Canada and NYC to Berlin and Belgium). Just a taste of what's to come: a reading room, lecture and installation piece by fashion renegades jugar, and an interactive sensory bike experience by Tokyobike NY, among other things. Sounds tres intrigant, no? 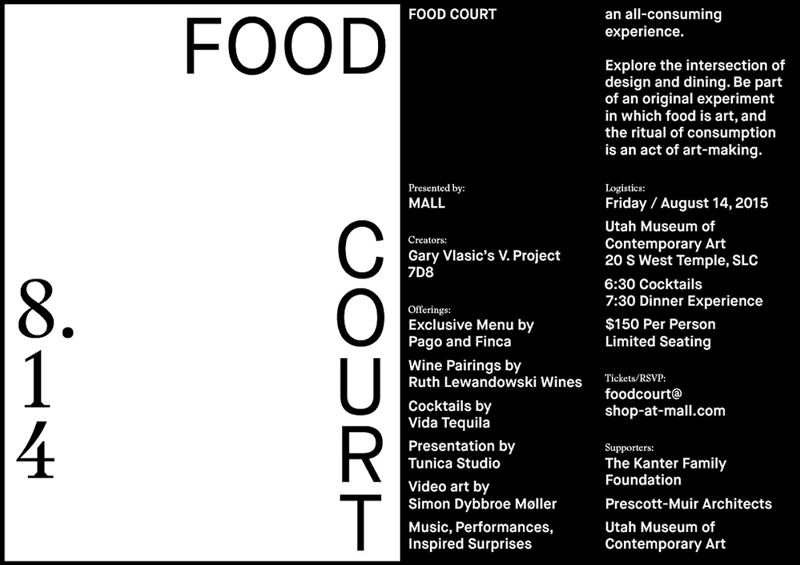 Better still, the whole month-long event is kicked off with FOODCOURT--a dinner event set to explore "culinary design and food as a design medium" (something we can certainly belly-up to). According to Vlasic, "FOODCOURT explores the rituals of dinner experience, consumption, and edible dinner installations...using taste, setting, and presentation as the foundation of all enjoyable eating experiences and dining experimentation". Lucky for all those in (exclusive) attendance, Pago and FINCA have partnered with MALL2 to create the "immersive dining experience". There's limited seating (only 100 spots available) so snap up your seat (and RSVP by today!). Extra nudge in the right direction: our COLLECTIVE dreamweaver Scott Evans (of FINCA, Pago, and Hub & Spoke) is co-designing the menu (which features Ruth Lewandowski wines and Vida Tequila Cocktails). 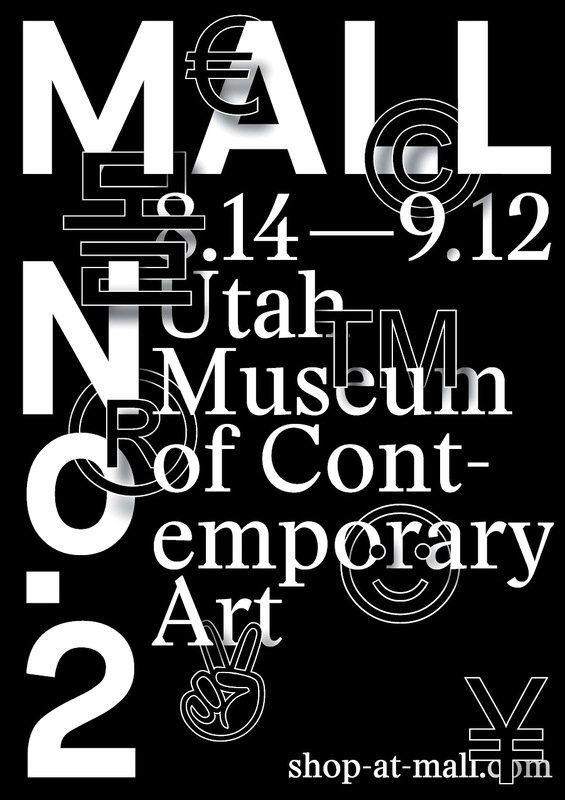 The foodie fete will be held in the main gallery of UMOCA on August 14th. The world of design is quite literally setting up shop in our backyard for a short while, friends. We think you'd do well to get in before they get on.